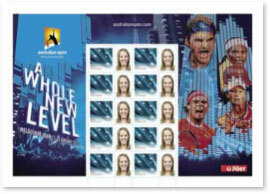 For several years Australia Post has had a personalised stamp stall at the Australian Open. This will be the first time the blue Southern Cross stamp is released as a personalised stamp. This sheet was printed by RA Printing, and the first personalised version of this stamp. A unique generic version was only available from the Australia Post stall. This personalised stamp was produced in sheetlets of 10 stamps with photographs in the tabs. Due to the popularity of the Australian Open it is likely that the selvedge illustration will be preprinted. While attending the Australian Open I found a postcard unknown to me. The card shows a photograph of a match between Jo-Wilfried Tsonga of France and James Blake of the United States of America, held on 26 January 2009. 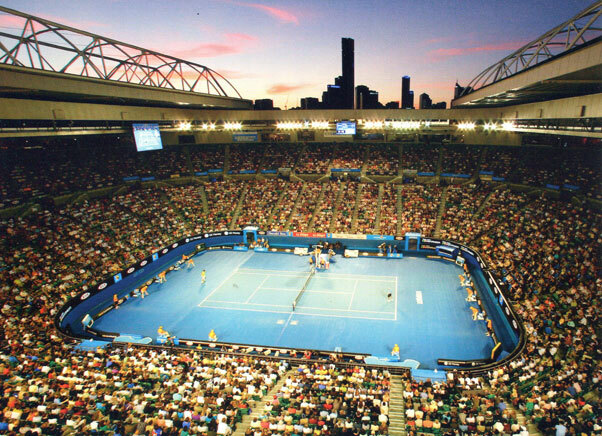 Given the date this postcard would�ve been produced for the Australian Open in 2010 or 2011. If you have any more information contact me.